Patients with severe chronic obstructive pulmonary disease (COPD) have a chaotic trajectory towards death. Research has focused on identifying a “transition point” that would allow identification of those patients who may benefit from a palliative approach to their care, or referral to a specialist palliative care service. This article aims to outline difficulties in identifying this transition point, summarise current literature on this topic and suggests a model based on clinical milestones. To outline the difficulties associated with identifying patients with severe COPD who are at risk of dying. To summarise current research on this topic. A specific transition point is difficult to identify in severe COPD. Tools are available that may assist the physician in identifying those at risk of dying. It is essential that the patient voice is heard, patients can describe specific events that may be used as a “trigger” for a palliative approach. Specialist palliative care services may only be required for a subgroup of patients whose needs cannot be managed by the primary care team. COPD is a slow and debilitating illness characterised by a series of adaptations to physical symptoms and loss of function . Patients with COPD seem at times lost between acute secondary care and primary care. Many receive excellent acute care; however, keeping an overview of the illness trajectory and the bigger picture can be challenging. Optimal timing around initiation of palliative care goals can seem elusive at times . Palliative care, largely associated with oncology and patients with cancer, has ventured into the unknown in helping to manage advanced, but chronic, long-term conditions. Questions remain as to how services designed for those who have a rapid decline, meet the needs of people in a pattern of slow deterioration [3, 4]. Traditionally, the medical literature has focused almost solely on quantitative data, numbers and facts, to drive models of care. Qualitative and mixed methods may give us new insights into the patients’ perception of care received. Allowing the patient voice to drive service development and decide how the health system can best meet their needs may be revolutionary and lead to changes in individual practice. The key questions are: when do patients with COPD benefit from the palliative approach and how should palliative care be configured for patients with COPD? 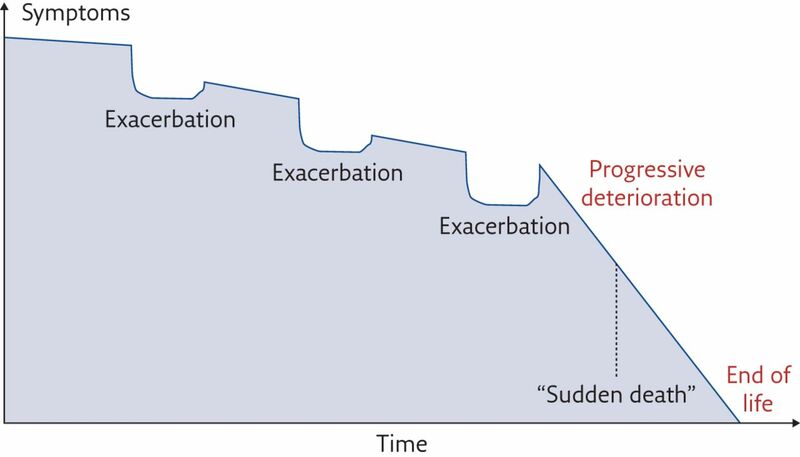 Patients with COPD follow a chronic disease trajectory, with long periods of slowly declining health punctuated with acute exacerbations that may cause the fatal illness (figure 1) . Families are often hastily prepared for the possibility of death, only to find their loved ones rally and survive. Eventually, death does occur and may be perceived as sudden and unexpected by the relatives. Throughout this rollercoaster experience, they receive little emotional and social support [6–8]. This course of events is highly unpredictable and prognostication is almost impossible. Therefore, physicians may shy away from the topic of death completely. Studies show that do-not-resuscitate orders are often not organised until the days leading up to death, the most traumatic time for the patient and their family . Physicians hesitate to discuss these issues, fearing that they are destroying hope for recovery, but without these conversations it is impossible to discover the patient’s wishes and preferred places of care and death. The disease trajectory expected in a patient with COPD. Adapted from . A review of the changing Global Initiative for Chronic Obstructive Lung Disease COPD guidelines highlights the ongoing discussion as to how to best identify patients care needs . Spirometry is the crucial investigation to diagnose COPD and is also used to assess the severity. In the 2017 edition of the guidelines, it is not used to estimate the patient illness experience. Patients are classified into different target and treatment groups using the number of exacerbations leading to hospital admission and the severity of symptoms using the modified Medical Research Council (mMRC) dyspnoea scale or the COPD Assessment Tool (CAT). The current classification into groups A, B, C and D appears temporary; it is likely to change in the future. It is complex enough for respiratory specialists, and certainly not intuitive or in any way meaningful for patients. The BODE (BMI, airflow obstruction, dyspnoea, exercise capacity) index is the best established tool to estimate the prognosis of a patient with COPD . It has a well-established research base. The BODE index combines information from the body mass index (BMI), degree of airflow obstruction, dyspnoea assessed by the mMRC dyspnoea scale and the exercise capacity as measured using 6-min walking distance. Based on severity, patients are divided into quartiles, which correlate well with the average survival. It is a well-validated research tool; the clinical application is limited by availability of a 6-min walking distance. Working in an acute care setting a large number of patients admitted to hospital will be in the higher quartile with a BODE score between 7 and 10, and have an 80% risk of dying within 52 months. Whilst well validated for population-based research, it is a blunt tool in clinical practice as it is difficult to apply on an individual level. The World Health Organization definition of palliative care focuses on all aspects of a person: physical, emotional, social and spiritual . It also includes the family, whatever that may look like for an individual. Palliative medicine is a relatively new specialty that is slowing being recognised as its own entity by medical schools and medical societies around the world. However, specialist palliative care should not be confused with the palliative approach. The palliative approach is the responsibility of all; conversations about the illness and what to expect is everybody’s business. Complex symptoms, emotional anguish, social issues and existential distress are all the remit of a specialist team, if available. In New Zealand, the term end-of-life care is defined in the National Glossary as the last 48–72 h of a person’s life . This is a time when the healthcare team needs to prepare the patient and family for the death and have an emphasis on comfort and dignity. Palliative care services across the world use the Supportive and Palliative Care Tool (SPICT), which guides identification of people at risk of deteriorating and dying with one or more progressive conditions . The purpose of the tool is to allow better care and planning for individuals and their families. SPICT was devised in Scotland and includes a section on respiratory disease. It uses shortness of breath at rest, the need for long-term oxygen therapy and past use of ventilation as key indicators that health is deteriorating. It also outlines seven general indicators of poor health. Patients have an even wider view of health that takes into account relationships, community and life in general. A scarcely resourced specialist palliative care service may not be necessary to make big improvements in their quality of life, if their needs are well-understood. This will allow palliative care services to be used by those with complex issues, which they are trained to manage. In 2015, Landers et al. published an article exploring patient perceptions of advanced COPD and their understanding of the “palliative approach”. This is a focus on quality of life than disease-modifying goals of care. The patients in this study were interviewed after a life-threatening admission for respiratory failure requiring noninvasive ventilation (NIV). The semi-structured interview questions explored the patients’ understanding of their COPD, future concerns about the impact of their illness, concerns about further hospital admissions and their perceptions of palliative care. Six themes or milestones were identified by the patients. The loss of recreation signalled a change in relationships and a transition to a more severe impact of the disease on their lives. A change in the home environment, such as downsizing or requiring residential care, was also a trigger for a new direction. Increasing episodes of acute care was identified as a milestone of change as was the commencement of long-term oxygen therapy (LTOT). Interestingly, shortness of breath did not feature much in the interviews. However, when dyspnoea became panic attacks this was significant, but was not always volunteered by the patient. Finally, needing assistance with self-care was also a marker for a change in focus. 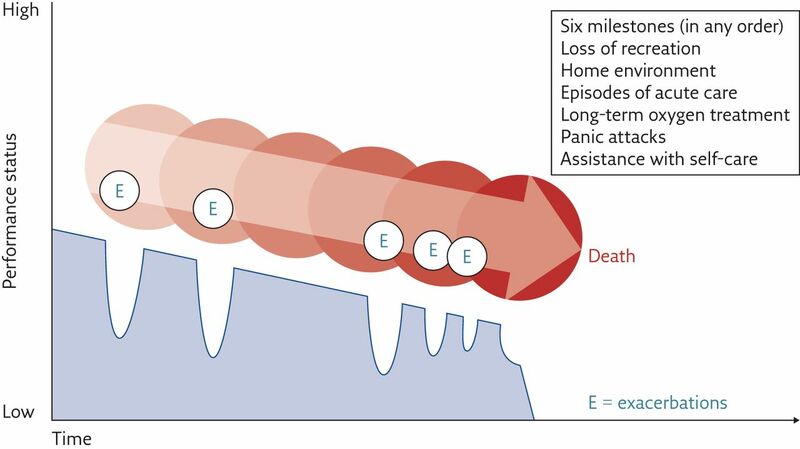 Based on the results of this study, figure 2 provides a graphical representation of the accumulation of these milestones as the patient comes closer to death . What is most critical is how this information changes what is offered to patients. Loss of hobbies and activity may lead to discussion about community groups that cater for those with physical limitations, but still provide social interaction. Families may need access to information about residential care options and legal advice. If a patient is requiring more frequent hospital admissions, there may be a need for an acute care plan at home, at the ambulance service, with the general practitioner (GP) and in the emergency department. At the time of starting LTOT, a patient should be offered the opportunity to complete an advance care plan. If panic is a major problem, a tailored breathlessness crisis plan can be organised through their primary health team. Patients requiring help with showering and dressing may need access to community services in a timely fashion. Trajectory of COPD. Reproduced from  with permission. This raises the ongoing question about how the various interventions doctors employ to “save lives” are perceived by the patients themselves. NIV is one of a few treatments in COPD that has been shown to improve survival . Although research has been published showing survival data pertaining to this intervention, little is known about the patient experience and how to potentially improve it. Using the same semi-structured interview as Landers et al. , Beckert et al. describe four themes that emerge highlighting key issues for patients after NIV. They disliked the mask to the point of feeling suffocated. The blood gas sampling was painful and one of the worst aspects of the NIV process. The airflow associated with the mask induced fear, but was better tolerated when gradually titrated upwards. Patients also had different cognitive experiences with NIV, including difficulty recalling events and hallucinations. However, despite all the negative aspects of the treatment, patients described it as a “life-saver”. They had trust it would keep them alive and would, therefore, subject themselves to it again. They trusted the doctor to make the right decision implicitly. It went even further than this; people made cognitive and behavioural adaptations to make the experience more bearable. Ultimately, they had trust in health professionals and delegated decision-making to their doctors. This article on NIV gave the patient a voice which can assist us, as health professionals, to improve the patient experience. The most pertinent finding from this study was the very clear mandate of the patient to delegate decision-making about NIV use and also end-of-life decisions to the treating doctor. This is in stark contrast to most patients with cancer. It is also in contrast to the calls of society for more autonomy around healthcare. Whether we embrace it or not, in this study patients with a longstanding chronic disease, COPD, placed much of the responsibility for decision making at the feet of the clinician. The scope for integration and improvement of the palliative approach is immense. This could be implemented at all levels, starting with some fundamental shifts in thinking. The first issue is that of prognosis and time frames with chronic diseases such as COPD at their “end-stages”. Gillick  proposed a rethinking of the “central dogma” of palliative care which is relevant to these groups of patients. At the time of diagnosis of a serious illness, people want information and the focus to be on life-preserving treatments and interventions. Function and comfort are further down the list of necessities. Over time retaining function in daily life comes to the forefront of people’s wishes, with life preservation now lagging behind. After perhaps months or years of treatment, a shift occurs in the way people view their life; comfort and dignity emerge as more important. Eventually, for many, towards the final stage of life it is the sole focus. It is recognition of this changing attitude in patients with COPD that needs to be developed by the medical profession as a whole, confident in their ability to assist the patient to explore the issues raised in this process. The question remains as to how this can be accomplished. As the majority of patients will have a GP, local palliative care services offering further training specifically to GP practices, including nurse practitioners, may help build confidence. This training would feature topics such as how to discuss the uncertainty of prognosis, what dying may be like, advance care planning and spirituality, all of which were identified in one study as being important to patients with COPD and not currently addressed . An essential part of this would be encouraging clinicians to allow adequate time during consultations to explore patient-centred issues and not just disease management. At the hospital level, there are multiple ways of approaching possible change. Education similar to that which is provided to GP practices, targeted towards both junior and senior members of staff could be organised. This does, however, depend on the willingness of hospital medical teams to learn new skills or adapt old ones. The respiratory service, in conjunction with specialist palliative care expertise, should develop rigorous policies and guidelines about end-of-life care in patients with severe COPD. One qualifying criteria for the pathway in this setting, at a minimum, could be an episode of assisted ventilation. Information in the form of pamphlets on available resources and advance care planning could be made accessible. Respiratory nurse specialists could also play a role in delivering advice and liaising with community services. This position should be attached to a respiratory ward, respiratory outreach programme or a pulmonary rehabilitation programme. A study on the provision of advance care plans in pulmonary rehabilitation programmes found that 67% of 218 programmes in the USA did not introduce patients to topics relevant to these directives . 77% of programmes indicated willingness and 86% would incorporate it into their curricula if provided with written resources. Yohannes et al. described and validated the Manchester Respiratory Activities of Daily Living (MRADL) questionnaire. It is a self-administered physical disability scale and takes less than 5 min to complete. It may have potential in selecting the most severe and disabled COPD patients. Additional relevant professionals could also be involved in these joint clinics such as psychologists (offering cognitive behavioural therapy) and dieticians. A discussion about further referral to a hospice programme could then occur, both between professionals and with the patient. This would have the added benefit of allowing palliative care practitioners to keep up to date with medical management, and respiratory consultants to view alternatives in end-of-life care. It is the responsibility of the palliative care service to provide written referral criteria to those referring COPD patients. On referral to a hospice service, patients with chronic diseases such as COPD need clear goals of intervention. It is important to step away from the cancer model of care as the trajectory is too difficult to predict. Clarifying goals allows discharge from a service once they are achieved. Traditionally, this has not occurred in palliative care services, but it may be one way of managing resources and staying within limitations of workforce capacity. It may also be necessary to extend goals of care and patient wishes to emergency services. Roberts et al. proposed a card system (similar to those provided to neutropenic cancer patients) for those not wanting a hospital admission during an exacerbation. An action plan for these patients could be drawn up with their consent. It would then be left with ambulance services and at the patient’s home. 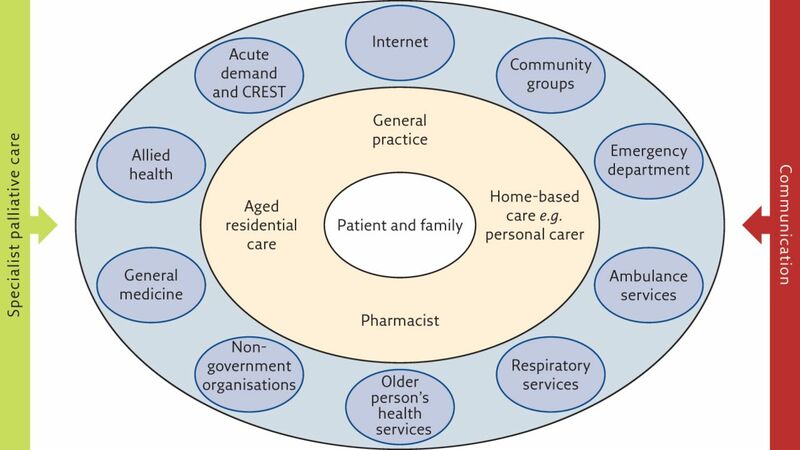 A new model for the palliative care of patients with COPD is proposed where the patient is firmly in the centre, surrounded first by their family and then by primary care (figure 3). All other services and interfaces are part of a wider palliative care approach with strong networks with each other and the palliative medicine specialist team. Proposed model for managing patients with severe COPD. CREST: community ­rehabilitation enablement and support team. Multiple studies have shown that patients with COPD wish to discuss their prognosis and future healthcare needs with their doctors, particularly their respiratory specialists [6, 23]. Many report little understanding of the course of their disease and want more information about what to expect as their illness advances . Despite the fact that many patients are aware of their own mortality, they see their death as distant; therefore, end-of-life wishes are not discussed . One recent qualitative study described this dichotomy as “looking though my illness to an uncertain but concerning future” . Participants in this study described fatalism about their disease course and avoided discussing or confronting issues such as end of life, yet acknowledged that death was foreseeable for them. In recent years, the concept of advance care planning (ACP) has been integrated into many healthcare systems. ACP is a process of thinking about, discussing and planning the future healthcare wishes of an individual, led by that person and their family with input from relevant healthcare professionals. Research has shown that ACP has a positive effect on end-of-life care for patients with reductions in life-sustaining treatments and increased compliance with patient wishes . Patients look to doctors to initiate discussions about future care planning and prognosis, yet there are considerable barriers to this occurring. One study of respiratory physicians showed that while the majority believed that ACP was important, a significant number found this challenging due to difficult prognostication, conflict with other chronic disease management goals or a fear of destroying hope. Many felt that patients did not wish to discuss ACP, or that they did not have the time nor skills to do so . GPs are more likely to discuss prognosis with cancer patients than those with COPD . Research has shown that patients are open to the concept of discussing ACP ; however, the ideal timing and setting for discussions has not yet been determined in the literature. General consensus is that the concept of ACP should be introduced early and patients repeatedly assessed for readiness to engage in such discussions . Milestones that mark the progression of a person’s illness, as described above , could also be considered triggers for raising or revisiting ACP with that individual. It is known that patients with COPD have little recall of hospital admission and treatments received. They are willing to undergo life-saving treatments despite the discomfort these treatments entail, generally expect to recover (as they have done previously) and have a high degree of delegation of decision making to healthcare professionals, specifically doctors [17, 24, 29]. This makes ACP challenging, but not impossible. Patients with COPD find it particularly difficult to make fixed decisions in advance . Rather than making concrete decisions about specific treatments, patients can be prepared for “how” decisions should be made if they are unable to communicate. This may entail appointing a proxy decision-maker, focusing on goals and outcomes (rather than how those outcomes may be achieved) and discussion about the degree of delegation of decision-making to healthcare professionals in advance. Knowing that a person does not have advance wishes around specific treatments means that a proxy decision-maker or healthcare professional cannot make a “wrong” decision. , et al. A comparison of the palliative care needs of patients dying from chronic respiratory diseases and lung cancer. Palliat Med 2001; 15: 287–295. Living and dying with severe chronic obstructive pulmonary disease: multi-perspective longitudinal qualitative study. BMJ 2011; 342: d142. , et al. Experiences of living and dying with COPD: a systematic review and synthesis of the qualitative empirical literature. Ont Health Technol Assess Ser 2012; 12: 1–47. , et al. Palliative care for people with non-malignant lung disease: summary of current evidence and future direction. Palliat Med 2013; 27: 811–816.
. Living well at the end of life. Adapting health care to serious chronic illness in old age. Washington, Rand Health, 2003.
, et al. The healthcare needs of chronic obstructive pulmonary disease patients in the last year of life. Palliat Med 2005; 19: 485–491. , et al. The use of non-invasive ventilation for the relief of dyspnoea in exacerbations of chronic obstructive pulmonary disease; a systematic review. Respirology 2012; 17: 300–307.
. www.goldcopd.org Date last accessed: August 13, 2017.
, et al. The body-mass index, airflow obstruction, dyspnea, and exercise capacity index in chronic obstructive pulmonary disease. N Engl J Med 2004; 350: 1005–1012.
. WHO Definition of Palliative Care. www.who.int/cancer/palliative/definition/en/ Date last accessed: August 20, 2017.
. New Zealand Palliative Care Glossary. Wellington, Ministry of Health, 2015. Development and evaluation of the Supportive and Palliative Care Indicators Tool (SPICT): a mixed-methods study. BMJ Support Palliat Care 2014; 4: 285–290. , et al. Patient perceptions of severe COPD and transitions towards death: a qualitative study identifying milestones and developing key opportunities. NPJ Prim Care Respir Med 2015; 25: 15043.
, et al. What can we learn from patients to improve their non-invasive ventilation experience? ‘It was unpleasant; if I was offered it again, I would do what I was told’. BMJ Support Palliat Care 2016; in press [https://doi.org/10.1136/bmjspcare-2016-001151].
. Rethinking the central dogma of palliative care. J Palliat Med 2005; 8: 909–913. , et al. Patients’ perspectives on physician skill in end-of-life care: differences between patients with COPD, cancer, and AIDS. Chest 2002; 122: 356–362.
. Advance care planning in chronic obstructive pulmonary disease: barriers and opportunities. Curr Opin Pulm Med 2011; 17: 103–109. , et al. The Manchester Respiratory Activities of Daily Living questionnaire: development, reliability, validity, and responsiveness to pulmonary rehabilitation. J Am Geriatr Soc 2000; 48: 1496–1500. , et al. Clinician perceived good practice in end-of-life care for patients with COPD. Palliat Med 2008; 22: 855–858. , et al. What matters most in end-of-life care: perceptions of seriously ill patients and their family members. CMAJ 2006; 174: 627–633. , et al. Negotiating hope with chronic obstructive pulmonary disease patients: a qualitative study of patients and healthcare professionals. Intern Med J 2012; 42: 816–822. , et al. Perspectives on advance care planning among patients recently requiring non-invasive ventilation for acute respiratory failure: a qualitative study using thematic analysis. Palliat Med 2017; 31: 566–574.
. The effects of advance care planning on end-of-life care: a systematic review. Palliat Med 2014; 28: 1000–1025. , et al. Specialist respiratory physician attitudes to and practice of advance care planning in COPD. A pilot study. Respir Med 2014; 108: 935–939. , et al. GP’s attitudes to discussing prognosis in severe COPD: an Auckland (NZ) to London (UK) comparison. Fam Pract 2005; 22: 538–540. , et al. Is hospitalisation for COPD an opportunity for advance care planning? A qualitative study. Prim Care Respir J 2012; 21: 261–266.
. Advance care planning discussions in chronic obstructive pulmonary disease: A critical review. J Palliat Care 2015; 31: 258–264. , et al. The views of patients with severe chronic obstructive pulmonary disease on advance care planning: A qualitative study. Palliat Med 2013; 27: 265–272.